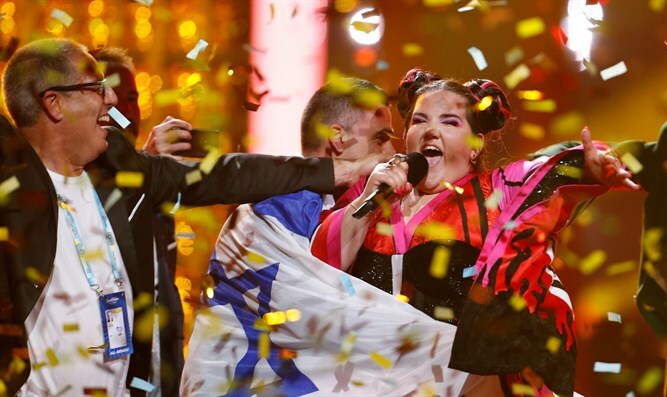 Dr. Hagi Ben Artzi, lecturer at Bar Ilan University, is disappointed with Netta Barzilai's song that brought Israel to first place in the 2018 Eurovision Song Contest. "They say that winning Eurovision is part of the gifts we received in addition to the transfer of the embassy, ​​and I am a little sorry to spoil the celebrations. There were Israeli songs in the Eurovision Song Contest that won high places like ‘Hallelujah,’ a song with words and content and a wonderful melody. Or the song ‘Kan’ [‘Here I was born, here my children were born’] which brought the Zionist, Israeli, Jewish ethos. "From a musical and technical standpoint as well, I am sorry to say - and maybe I am too old to understand the musical taste of the younger generation - but the song as I heard it is a collection of shouts and groans. I also did not connect to the content, which is not Israeli Jewish content. Ben Artzi misses the songs of the past, "songs that won high places in the past and brought the good Zionist message. This song does not represent Israel and there is no need to worship around it. There are songs that express the great spirit of Israel, the spirit of the Bible, like ‘Yerushalayim Shel Zahav’ [‘Jerusalem of Gold’] by Naomi Shemer, who was a kibbutznik from Kinneret, not religious and not haredi, but her songs were filled with words from the Bible, history, tradition, and Zionism. "The president of the United States canceled the recognition of the UN resolution, and after seventy years, he basically says that it is null and void and that Jerusalem is the capital of Israel. This is a far-reaching step, which means that the US recognizes that Ashkelon, Ashdod, Jaffa, Nazareth and Nahariya are also not international cities as determined by the United Nations, but are part of the State of Israel. "I am very hopeful that the United States, the great superpower that annulled the United Nations decision and recognized the achievements of the War of Independence, will in the future also recognize the achievements of the Six Day War," Ben Artzi added.